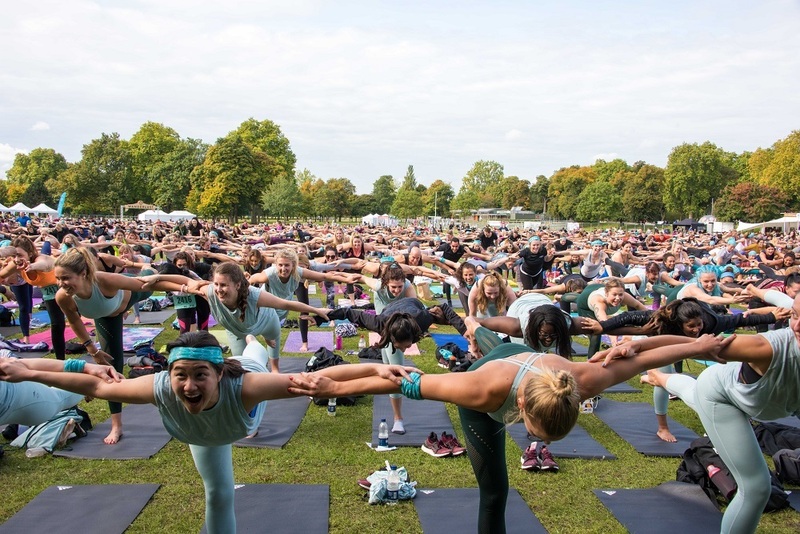 More than 2,000 people gathered in Victoria Park, London on Saturday, September 23rd for Wanderlust 108, the UK’s first mindful triathlon of a 5k run (or walk), 90-minute outdoor yoga session and 30-minute mass meditation. 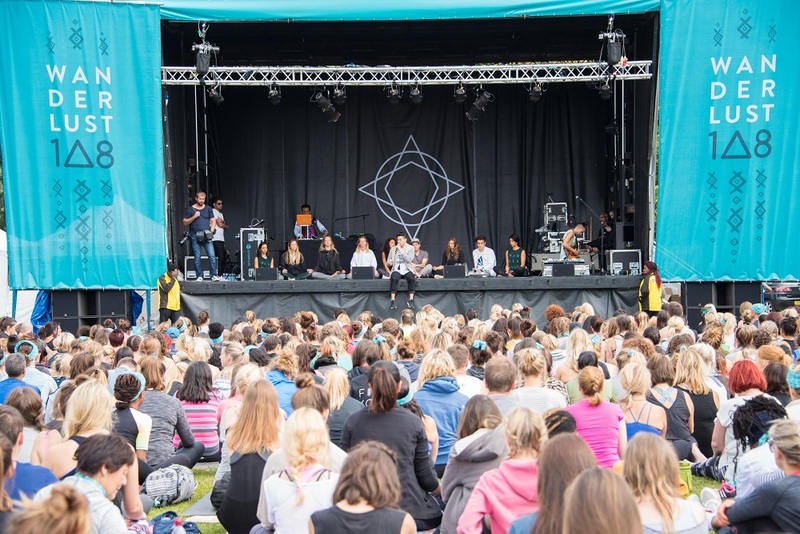 The day was soundtracked by live DJs and musicians, plus classes including yoga, acro-yoga, hooping, walking meditation, singing bowls, slacklining, indo boards and dharma wheels. Ann McManus rolled out the yoga mat for the day. I left feeling thoroughly revived. There had been so much energy and encouragement radiated from each of the morning’s leaders. Being super competitive, I liked the idea of a sports festival. I wasn’t so sure about one which didn’t involve strive for a prize. But I do love turmeric lattes and attending something constructive early on a Saturday morning and so I jumped at the opportunity to head over to Victoria Park for an 8am start last Saturday. Arriving there early, Wanderlust 108 immediately won points for their welcome squad, which included the MC for the day, Channel 5 Entertainment News’ Will Sebastien. Having someone so high profile in the scheme of the day greeting guests and asking them how they were was a simple but very effective way of making the event seem genuine and intimate. As I made my way round the park, I realised I had made a real rookie error. I had not brought my own yoga mat. This was a clear giveaway that I had not committed to the sport to the point of practising outside the free classes at my gym. 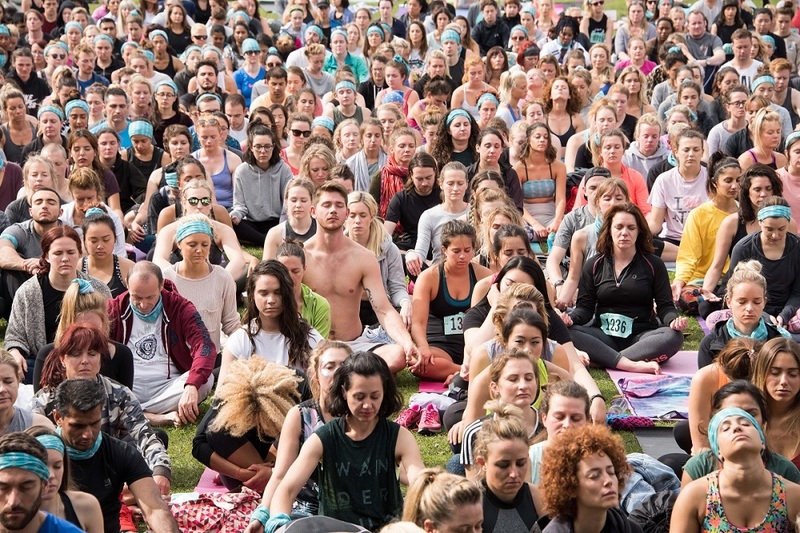 For a yoga regular, bringing your own yoga mat may have went without saying. I was a little disappointed that this had not been clearly highlighted as it caused non-regulars to feel slightly excluded. 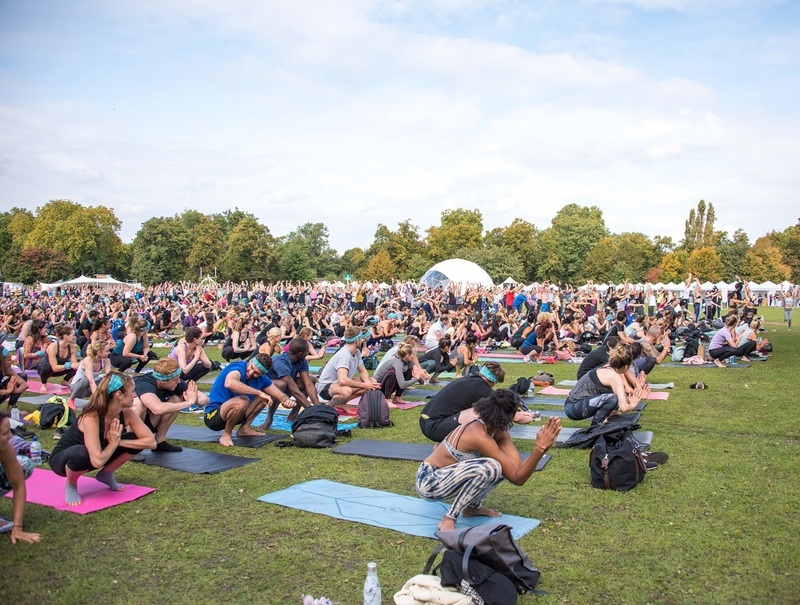 Thankfully the lovely Celest Pereira, one of the rock stars of London’s Wanderlust 108, came to my rescue, gifting me one of the most beautiful yoga mats I’ve ever seen (admittedly I am not a connoisseur!) from Liforme. As the last 15 minutes before the 5k drew in, I went to drop my jacket and bag, taking a delicious turmeric latte from one of the vendors to stay warm while waiting for the run to begin. As a stickler for a plan when it comes to sports, I was counting on the 9am start for the 5k. I’m a temperature sensitive wuss, and so I was a bit put out that we had to wait around for until 9.15 in the light rain until the warm up began. There seemed no reason for the delay. 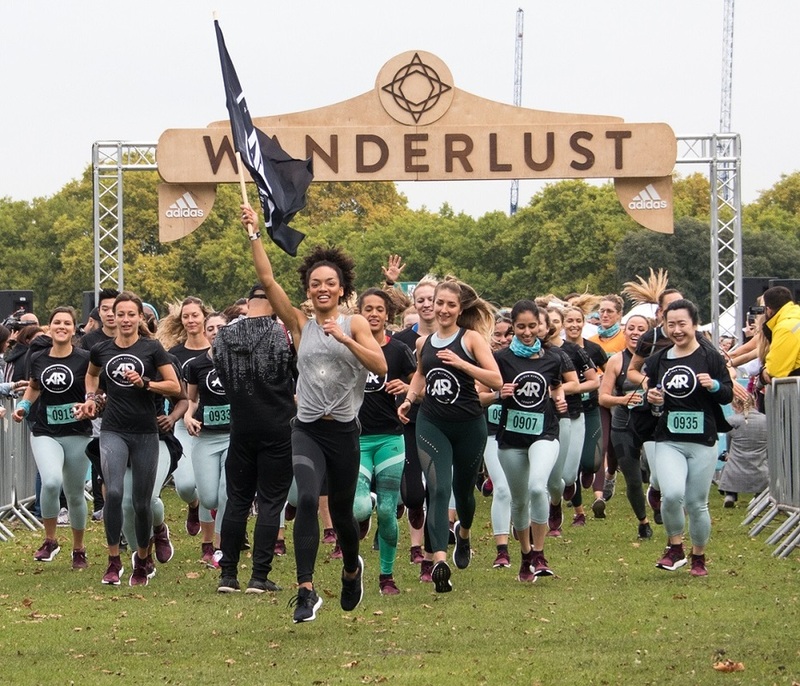 However, the moment Adidas ambassador Adrienne LDN came on stage and began her invigorating warm up bump, Wanderlust 108 were instantly forgiven. This lady was fire! In time to the bouncy pop and dance tunes courtesy of DJ Taz Rashid, we commenced a cardio-fueled body pump warm up as Adrienne successfully summoned us to give it our all. Moving over to the start line, Adrienne led the elite group with a flag and enthusiasm that kept all those in her vicinity for the run driven to keep up the pace. Despite having been told that the 5k was not a race, I was conscious of the fact that we had been given racing numbers. Therefore, it might be a race and I should win. Conservatively I placed myself in the second from fast set, but looking at my fellow class-entrants, I saw people wearing string strapped gym bags, and instantly regretted not having the gumption to place myself in the fastest group. I could hear the commentator guiding us to simply enjoy the run and focus on ourselves and not the crowd. I liked the thought. But part of what I enjoy about running (and most things generally) is running faster than other people. Thinking about this, the second group was ideal. As the race began I got a buzz from overtaking all the slow fast group and even greater thrill catching the people I’d suspected might be rivals - particularly as they’d started before. We all won without anyone knowing their time. 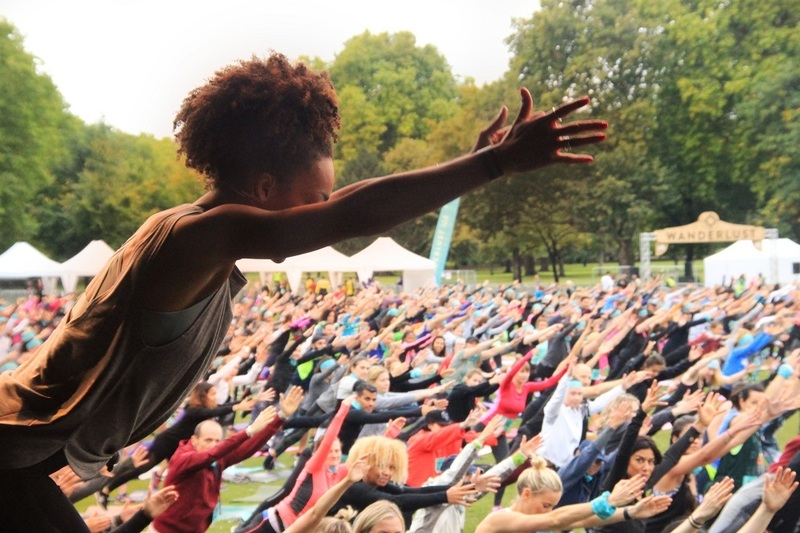 Next on the line-up was a 90 minute yoga session with two of Triyoga London’s hottest instructors. As with many of your fair-weather yoga fans, the lack of pace and energy can be a deterrent to doing more yoga. Celeste Periera and Julie Montagu turned all that around for me. These ladies were high energy, creative and encouraging throughout. Celeste introduced break dancing moves into our warm up, and if there was opportunity to work a twerk into any classic yoga position, Celeste would break it down for us. Twerking planks anyone? Julie Montagu pushed us on to some harder moves once we had found comfort on our mats. (Shout out to my mat here: the Liforme mat was carefully designed to help novices map out where to place hands and feet - and it magically provided grip for my excessively sweaty palms). Julie’s style of teaching urged us to push our stretch on for just a little longer, providing three graduations for each position. This helped the wobbly ones among us feel at one with the perfectly poised. 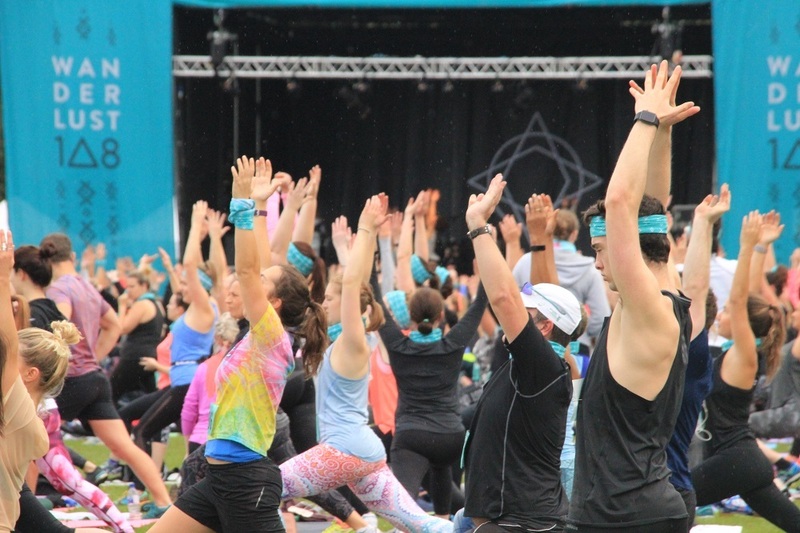 The mindful triathlon concluded with a 30-minute meditation guided by inspirational speaker and senior yoga instructor, Michael James Wong. Michael is the founder of many yoga movements, namely Boys to Yoga, an international drive to encourage more fellas to take up yoga. With an incredibly soothing tone, he led us into a restful state through visualisation and confidence boosting mantras. He was aided greatly by the enchanting sounds of Arli Liberman’s exotic vocals paired with electric guitar. The guidance served its purpose and I am not sure how long I zenned out for, but when I came back I felt feather light and empowered. After a final inspiring word from Michael, DJ Taz started up again with some soulful world house vibes and the crowd were encouraged to hug and thank one another for supporting one another through the session. Before heading round the stalls, we tried out a hula hooping class. Again, showing ourselves up as novices, hoops rolled astray and flew up in the air. Patience and encouragement was certainly a common sentiment throughout the day, as one of the instructors repeatedly returned to tutor us through each move. I left feeling thoroughly revived. There had been so much energy and encouragement radiated from each of the morning’s leaders, each delivering their mantras from a different angle that I’m sure all attendees left the park feather-light. For more information about Wanderlust go to wanderlust.com.